I did try to get on here before now but I have a new little angel that demands my attention as well as my 20 month old little cherub boy. Our little girl is now just one week old, and makes my ability to one hand type better then it has been...lol. Any way when I have both hands available to me I will post more. And congratulations again on your gorgeous little girl! Nice forum you have here! Am about to go explore while I am not needed as a moo cow. Hi Becs! Look forward to chatting to you. Mmm sorry guys have been busy of late, Bridget is now 4 months old today, and Beau-Keith's 2nd birthday is this month. Today I sat down and wrote out his invites for the party on Spiderman invite paper...lol We are going to have a few friends over nothing to big I just hope our fence is fixed before the party as I can imagine the lady over the backs son wanting to climb over and join in. He is too old and a little to ill mannered for my liking. As only kids his age (maybe five not sure) can be. Any way I have been busy with my own forum and have decided to put my sewing skills to the test by making satin pouches lined. Unfortunately I do not have a sewing machine so I have to sew by hand and it takes for ever and I am sure it will ruin my eye sight. Just as long as I get good money from selling them on E-Bay. 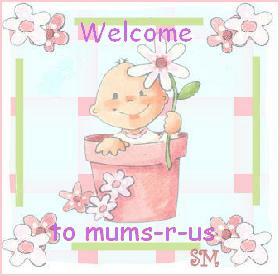 Well that is me in a nut shell so far, I hope all is well with every one here on Mums R Us. Hi Bec.As you can see it's dead here at the moment. lol. All explained in the other thread.